This Italian entrepreneur reached CZK 492.8 million in 2002 net profit with his company Karlovarské minerální vody, which is 75% growth compared with the previous year. Following its huge success on the rapidly growing Czech market, the firm plans to expand abroad. The general director of Autopal-Visteon Nový Jičín is the first Czech to receive the prestigious Dale Carnegie Leadership Award, which is presented annually by the New York-based consulting company Dale Carnegie & Associates Inc. The general director of the central European branch of leading corporate software developer Logica CMG announced that the firm is transferring its central European center to the Czech Republic. Expected investment should reach around CZK 100 million. This travel industry mogul took a business risk that put his firm into debt of nearly half a billion crowns. Despite the fact that he managed to avoid bankruptcy with the help of a strategic investor, Atlantic FT, he lost the dominant position in his own empire. The ODS Senator faces suspicion of accepting a CZK 40 million bribe in 1999 as a commission for arranging the sale of Severočeská plynárenská and Severočeská energetika shares to a German buyer. Novák is still denying the accusation. The Information Minister let the semi-state-owned Český Telecom pay for his five-star hotel accommodation during the Karlovy Vary film festival. According to Transparency International, this represented a clear conflict of interest. “CALL ME GERARD,” says this smiling thirty-nine year-old Irishman, currently the general director of the Czech and Slovak branches of GE Capital Bank. His subordinates call him by his first name, he sometimes has lunch with rank-and-file employees, and he likes to hear their opinion about how the company is doing. He travels all around the republic visiting the branch offices to get to know even the lowest levels of the financial colossus that employs 2,400 people in the Czech Republic alone. His open personal policy and the changes that began under his predecessor, Petr Šmída, are bearing fruit – consider the ten prestigious awards that the bank garnered over the course of six months. These include the Employer of the Year 2003 (announced by Fincentrum), which Ryan considers the crowning glory. “We try to make a good environment. Our people work hard, but they are remunerated well, they learn new skills, and their ideas are respected,” he says, explaining why the fourth largest bank in the country has become a desirable destination for many college-trained specialists. The economic results of the bank are equally impressive. 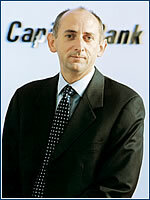 During the first half of 2003 the bank ended with a record 73% rise of net profit compared to the previous year. However, it is not easy to keep the dynamic pace. Ryan only smiles over the question related to leisure time and explains that if he has any, he spends it solely with his wife and three children. Ryan, who came to Prague from GE Capital Bank UK claims to feel at home here. “We Irish share the same sense of black humor with the Czechs. It helps us survive situations where there isn’t much to laugh about, as it does for you,” he says. MICHAL KAČENA (39) holds in his hands the fate of the so-called family silver. 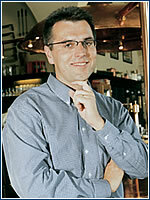 As manager for corporate affairs at Plzeňský Prazdroj, he is responsible for building the Plzeňský Prazdroj brand (Pilsner Urquell). The second largest brewing concern in the world, SAB Miller, which owns the brand, has declared it its flagship and most important asset, for which it has big plans. By 2010 it wants to turn it into one of the five largest beer names in the world. And Kačena and his team will be there. He is certainly no novice in the field of image-making. This nuclear engineer by profession used to work in the first half of the 1990s as a PR manager at ČEZ power company, which was then newly established. He had to learn open communication on such topics such as the nuclear power plant Temelín. After seven years he left to tobacco giant Philip Morris and then ended up “near the beer”. His earlier efforts to build his team and programs for managing the corporate brand have already paid off. A few months ago, Pilsner Urquell won a corporate image competition organized by the Rhodos association, represented by the GfK Praha agency, Ogilvy CID, and the publisher Economia, for the third time. “I believe that we won the award thanks to our systematic work and transformation of the company over the last three years,” says Kačena. “Such awards are gratifying and provide our employees with motivation, while for customers they serve as confirmation of high quality and an assurance that their trust is properly directed,” he observes. He does not have a lot of free time, but when he finds some he likes to devote it to his family, friends and sports – skiing, cycling or golf. “I have three women at home, wife and two daughters, who take my mind off work and ‘men’ things. They care about me and create a welcome background. For this I thank all three of them,” he says.